SCORE!!! Got Me a Ramen Burger!! 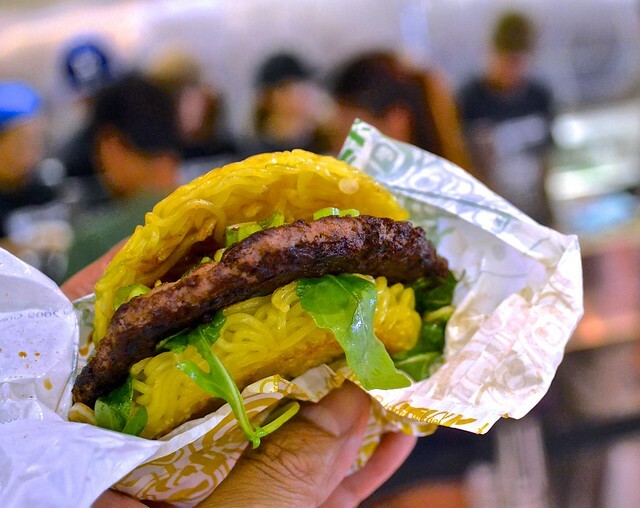 The Ramen Burger Pop-Up at Mitsuwa Marketplace. Also...The LINE-sanity Video! Behold!! The Ramen Burger is MINE!!! The line queueing up for the highly anticipated Ramen Burger So Cal pop-up at Mitsuwa Marketplace in Torrance, CA and the next day at Osawa Japanese Cuisine in Pasadena, CA bordered on madness. A four hour plus, thousand person line at Mitsuwa shattered what you'd see outside an Apple Store the night before a new iPhone release. People entertained themselves with RC cars and puppies. There were plenty of selfies in the ridonkulous line, tweets, and status updates with observations such as "Dude! WTF! I'm in the RamenBurger LINE! IT's STOOOOPID Loooooong!!! The burger itself is a 75/25 certified angus beef patty. It's pretty great. Even better with a beer, if I had one. I wouldn't wait in that Cold War, Eastern Euro-line for a taste though. I didn't have to!! I'm not sure if it tastes better the longer you had to wait or vice versa. Experience the line and see the Ramen Burger here! I did a video just for you!